The Flower card Company started with Florists in mind and we soon realised that the cards were also perfect for gift ware. Small but perfectly formed, gift cards are the perfect size for the finishing touch to smaller items of giftware, jewellery and flowers. Created from original paintings by owner and artist Caroline Crawford, the artwork is then printed into small folding cards. 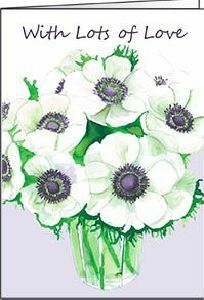 Inspired by current trends in the industry Caroline paints the images in watercolour, using colour palettes including the ‘white range’ to compliment current trends and occasions. These are then printed on beautiful silk sustainable board and all the cards are printed here in the U.K and sold in packs of fifty. The feedback from our customers tells us that these special little cards are used as keepsakes long after the gift or flowers were given. They are an ideal size being small so that they work with giftware, jewellery and flowers. Keepsake cards also fit into a purse or wallet and as the name suggests they tend to be kept as a reminder of that special gift and the person that gave the gift.